Shiroka Laka is a lovely village, comfortably lied in the central Rhodope Mountains, South Bulgaria. Its name means "wide meander". 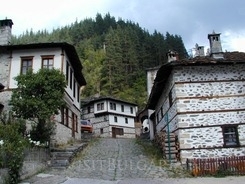 Shiroka Laka is a national architectural and folklore reserve. It is famous for authentic Rhodopean houses – of the Zgurov, Uchikov and Grrigorov families, as well as the unique iconostasis in the local Chirch of the Holy Mother of God. Shiroka Laka is the music heart of the Rhodopes – the mountains of the legendary Orpheus. It is the source of the famous Rhodopean sings and their unique tunes with caba gaida (a local type of bagpipe) accompaniment. The most prominent folklore singers, bagpipers and ensembles are discovered and created in a National school for folklore arts – Shiroka Laka. The Shiroka Laka Hotel is situated in the close proximity of that centre of Bulgarian culture. Shiroka Laka is a great place for tourism. Besides the original architecture and plentiful music culture the village is famous for its harmonic effects of the surrounding mountain nature.